If you’re thinking something looks quite different this month, you’re absolutely correct. We’ve taken our usual content and thrown it out the window. You see, it’s our 75th anniversary, so we felt that no ordinary magazine edition would suffice. Our goal: Produce an issue with our staff on location in a rich and colorful area of Texas. But where to go? Texas offers many great choices, but it didn’t take long for us to form our unanimous decision, based on outdoor recreation, wildlife, parks, culture, history, food and fun. Bird feet lead visitors to the observation deck at Estero Llano Grande. We spent months planning what we hoped would be an issue full of whimsy and fun, a love letter to the Valley. We made lists of people to meet, places to see and things to eat. Some of it, we just left to serendipity, allowing ourselves to follow where the road led. We drew a 50-mile circle to delineate our area. South Padre Island beckoned us, too; it was just too close to ignore, even if it’s not technically the Rio Grande Valley. Fast forward to September. We kissed our families goodbye, packed up computers and cameras and headed to our “office” for the week — the bunkhouse at Estero Llano Grande State Park in Weslaco. To beat the heat and utilize the soft morning light, we rose before dawn each day. Straggling in after the sunset shots made group dinners run late; planning meetings began at 10 most nights and ended around midnight, when we fell exhausted into our bunk beds, if we didn’t stay up a bit longer to write a few articles, sort photos, edit videos or work on putting it all together in a layout. In between, we indulged in attractions that appealed to our varied interests. The highlight of Publisher Randy Brudnicki’s week was a boat ride (even though there wasn’t much time for fishing) on the Laguna Madre, while Managing Editor Russell Roe crawled through ocelot tunnels and appeared on the Brownsville television news talking about the city’s bike trails. Art Director Nathan Adams and Business Manager Traci Anderson provided many of the laughs with their search for pop culture and kitschy tourist attractions. Photo intern Catherine Groth and TPWD fine artist Clemente Guzman returned with stars in their eyes after hanging out with the photo pros at Hector Astorga’s Santa Clara photo ranch. Photo Editor Sonja Sommerfeld and I searched out authentic tortillas and ogled the unfamiliar meats at the carnicería next door. We embraced the culture, food and fun of the Valley, while the warm, loving people spread their arms wide to welcome us. It was a marathon of fun and hard work that we’ll never forget. This issue is a loving scrapbook of our week in the Valley. This resaca near Mission provided Clemente Guzman's inspiration for our cover painting. Driving and hiking along the Rio Grande proved endlessly fascinating. Here and there, sections of the tall rust-colored slats of the border fence built in 2010 block the view of the winding green river. 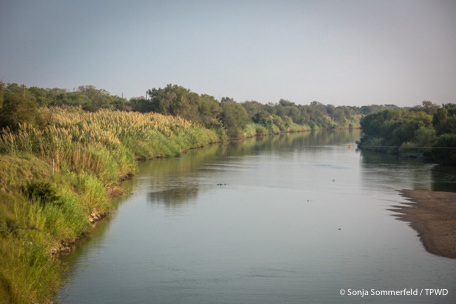 We visited Santa Ana National Wildlife Refuge, where groundwork for the new border wall has begun along the levee, and also saw where the wall is planned to cross the National Butterfly Center and Bentsen-Rio Grande Valley State Park. Although we decided from the start to not broach the subject of the border wall (because so much is still uncertain), we couldn’t help but wonder what the physical and visual impact might be in these stunning nature preserves. Not only does that grand old river wind powerfully and beautifully along the Texas border, affording one gorgeous photo landscape backdrop after another but, oh, the wildlife it attracts. Birds are the stars of the show here. 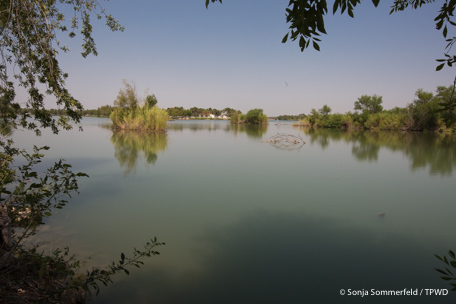 With more than 500 species reported at the nine parks of the World Birding Center, not to mention other local parks and wildlife watching spots, this stopover on the Central Flyway attracts avid bird watchers from across the world. Most of us added new species to our life lists, just as those visitors do. Of course, the wildlife watching doesn’t end with birds. The National Butterfly Center in Mission is a hot spot for rare species of those winged wonders. Ocelots roam Laguna Atascosa, though we weren’t lucky enough to spot one on this trip. Javelinas, indigo snakes and alligators were in plentiful supply at parks and nature centers. Even the plants put on their best show for the Valley, with ebony forests and flowering wild olive trees. With such a short time frame, it was inevitable that we’d miss out on some adventures. After a warm welcome at the McAllen Business Expo, we spent an afternoon exploring McAllen but arrived at the new International Museum of Arts and Science after it closed for the day. A few parks were closed for repairs, but there were so many others: state parks, national wildlife refuges, county parks, city parks, nature centers and more. 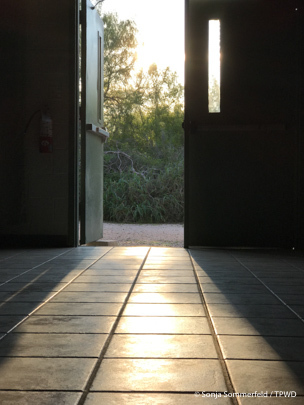 Morning light pours through the bunkhouse door at Estero Llano Grande State Park. The southernmost four counties of Texas (Cameron, Hidalgo, Starr and Willacy) hold an amazing amount of people — more than 1.3 million, making it the fifth-largest metropolitan area in the state, surpassing El Paso. Unlike other major population hubs, we found few traffic jams as we crisscrossed the region. And the food! Of course, we gorged on Mexican specialties and seafood everywhere we went. No chains, no big restaurants — we wanted to eat at the locals’ favorites, so we asked for recommendations from the locals and were never disappointed. Good thing we hiked every day, or we’d have returned muy gordo. Our time in the Rio Grande Valley — from Edinburg to McAllen to Harlingen to Brownsville and all the towns in between — and South Padre Island was unforgettable. We encourage all Texans to add the Valley to their bucket list. 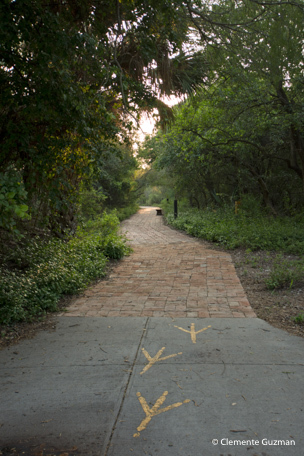 Whether you like to fish or hunt, hike or bike, bird-watch or paddle, the Rio Grande Valley has all that and so much more. Nos encantó! We loved it!